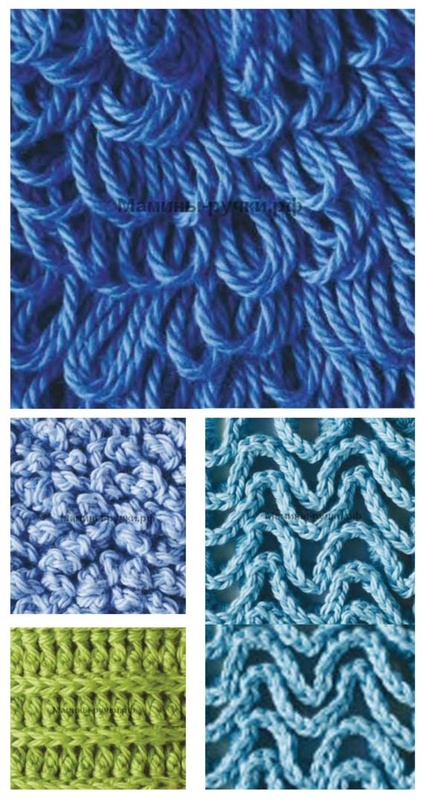 This fluffy pattern of double loops knits very simply. The number of loops is any. Forming series: 1 ssn in the 4th vp from the hook (count as 2 ssn), 1 ssn in each loop to the end. Row 1 (rel. ): 2 points. lifting, * insert the hook in the trail. ssn, holding the thread with the right hand (thread around the hook and around the first two fingers of the left hand) 2 times, stretch the three threads through the ssh, lower the n., grab the thread and stretch through 4 sts on the hook - the elongated stitch is made; repeat from * to last. etc., 1 sb in the 3rd in the ascent. Row 2: 2 in the ascent, 1 in sb in every n. Until the last. n., 1 sbn in the 2nd in the ascent. Row 3: 2 in height, 1 elongated loop in each sbn until the last. n., 1 sbn in the 2nd in the ascent. Repeat rows 2 and 3, ending with the 2nd row. Forming series: 1 sb in the 3rd vp from the hook (count as 2 sb), 1 sb each in the end to the end. Row 1 (rel. ): 2 in the ascent (count as 1 sb), knit behind the back walls of each sbn pr., 1 sb on the next. sbn, * 5 in, 1 sb on the next page. sbn; repeat from * to last. n., 1 sbn in the 2nd in the ascent. Row 2: 2 in the ascent, knit 1 sb in each sab. series, stacking the chains from the Bp before work, until the last. n., 1 sbn in the 2nd in the ascent. Row 3: 2 in the ascent, knit behind the back walls of each sbn pr.r., 1 sb per second. 2 points, * 5 in, 1 sb on the next page. P.; repeat from * to last. 2 points, 1 sb, 1 sb in the 2 nd stage of the ascent. Row 4: as the 2nd row. Forming series: 1 ssn in the 8th from the hook (count as 1 ssn, 2 vp and 1 ssn), * 2 in, skip 2 in, 1 ssn on the next. P.; repeat from * to the end. 2nd row: Knit as the 1st row to the last. n., 1 ssn in the 3rd in the ascent. Repeat the 2nd row to the desired size, then cut the thread. 1st row (face side): attach the thread to the 2nd in the upper right corner of the last. the grid row, 3 in, 2 ss around 2 in, * turning the grid to make 3 ssn around the trunk of the track. ssn, turning the grid 3 ssn around 2 in, turning the grid 3 ssn around the trunk of the trail. ssn., turning the grid 3 ssn around 2 in; repeat from * along the row, finish 3 cms around 2 cents. Cut the thread. Repeat this row on each row of the grid, moving down. This dense, soft rubber band crocheted, for a two-leafed fabric. Forming series: 1 ssn in the 4th from the hook (count as 2 cc), 1 ssn in each n. To the end. 1st row: 2 steps in the ascent, * on the front relief ssn for each ssn until the last. loops, 1 psn in the 3rd in the ascent. 2-nd row: 2 in the ascent, * on the front relief ssn for each ssn until the last. loops, 1 psn in the 2nd in the ascent.